Ever wonder what Amazon would do when its purchase of Whole Foods finally won regulators’ approval? Well, we finally know. The Jeff Bezos show is now selling Amazon Echoes in the Whole Foods produce section. They’re the “Pick of the Season,” too! We’ve also received emails from readers who saw this display—which isn’t exactly a surprising development in the larger story of Whole Foods and Amazon. The sheer tone deafness of selling electronics next to locally grown organic tomatoes is pretty hilarious, though. It makes you wonder where Amazon will peddle its Kindles. Next to the almond butter machine, maybe? 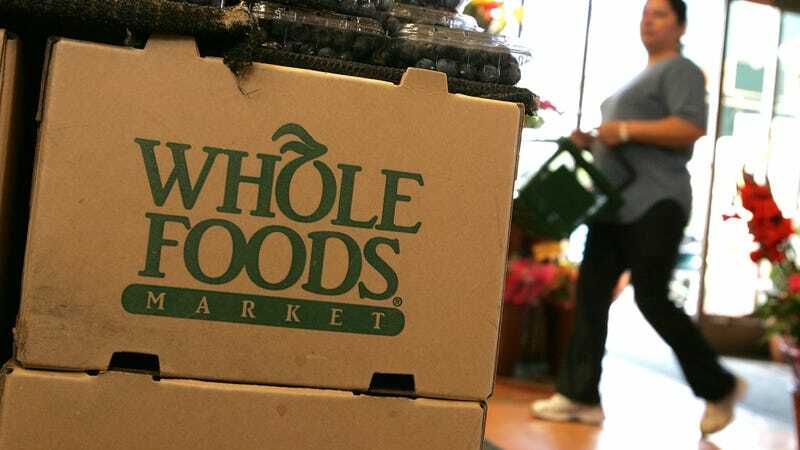 Jokes aside, Amazon has promised to lower prices across a wide range of food items at Whole Foods. Bloomberg reports that some products will be discounted by as much as 43 percent. Of course, Amazon might just be doing this for some positive press early in its ownership of America’s largest overpriced grocery store. But if you like organic rotisserie chickens, you can save yourself four bucks at Whole Foods today, because now they’re just $10 instead of $14. Go ahead and buy an Echo while you’re picking up a salad, too. You know that’s what you really came to Whole Foods for.